WMW has put together the front end maintence package for you. 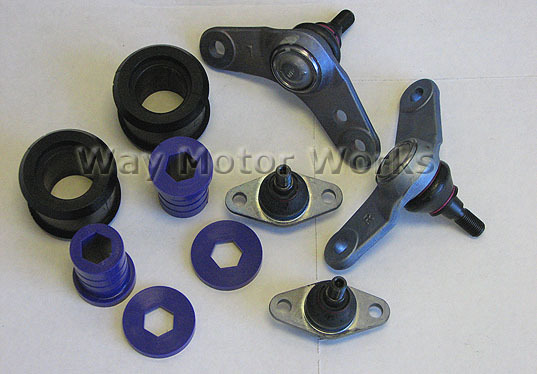 This package includes a set of front Powerflex control arm bushings, both inner ball joints, and both outer ball joints for your 02-06 R50, R52, R53 MINI Cooper or MINI Cooper S. Many customers have chosen to replace all these together to save them time and labor since the jobs overlap. We also offer this pacakge with the powerflex control arm bushings prepressed into brackets to save you time, select option below. Prepressed option requires core return. The prepressed made the job easier and a bit faster. Definitely the kit to get if your mini isn't tracking straight anymore! I recommend also getting a good sized hammer for the old balljoints out!